Dr. Hatda is the second person from a riparian country to hold this position. He replaces Pham Tuan Phan of Viet Nam. Dr. Hatda earned a Master’s in Agricultural Systems from AIT in 1997, after which he completed a doctorate in Development Studies from the University of Tokyo. 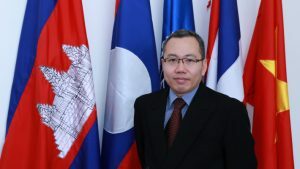 MRC is an intergovernmental organization that was established in 1995 following the Mekong Agreement between Cambodia, Lao PDR, Thailand, and Viet Nam. It focuses on regional dialogue and cooperation in the lower Mekong river basin and serves as a regional platform for water diplomacy as well as a knowledge hub for water resources management for the sustainable development of the region. Dr. Hatda’s appointment was announced by the MRC’s Ministerial Council following an initial selection by the organization’s Joint Committee. Earlier, he served as Director of the MRC Secretariat’s Planning Division from 2016 onward.